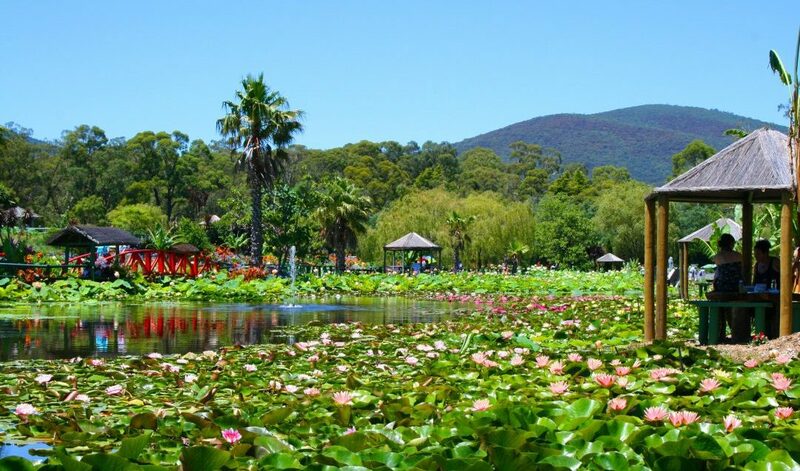 The gardens have been extensively landscaped with a “tropical theme” featuring dozens of built waterways including lakes, ponds, lagoons, bogs and even a waterfall. All of the waterways contain hundreds of varieties of flowering lotus, waterlily & bog plants. The surrounding gardens feature vast perennial flower beds, creating a kaleidoscope of colour in every direction. While hundreds of trees, palms and shrubs offer shade and add to the vistas. This is our largest lake in the garden holding over 11 million litres of water. It stretches almost 500m long and contains over 70 varieties of waterlily flowers creating a carpet of colour across the lakes surface. A feature of the display is our prized collection of Claude Monet’s original waterlilies, that he planted in his garden at Giverny in France. At the end of the lake a plantation of hundreds of Mrs Perry Slocum Lotus, Hindu Lotus and Cream Lutea Lotus add to the visual experience, producing thousands of blooms every day. The gardens surrounding the lake also contain a plethora of perennial flowers and shade giving banana and cocos palms. The lake also features a 300m walk through its middle, with 11 bridges including the famous red arched bridge. Often native water birds such as Giant Egrets, Water Hens, Spoon Bills and numerous ducks are seen foraging for food or build nests. On the southern side of the lake a sandy pathway offers easy access with numerous picnic shelters for people to rest and take in the stunning views. Adding to the vista is two fountains built in the shape of giant lotus flowers, they seem to float on the lakes surface producing a dancing reflective effect of their surroundings.